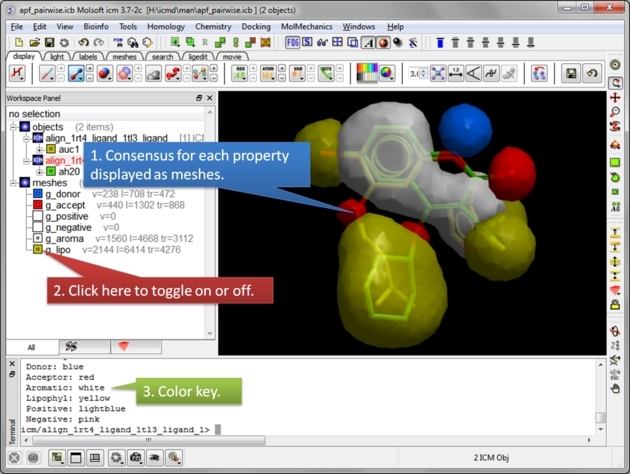 Generate a consensus pharmacophore from the APF fields. Calculate a pairwise APF score. 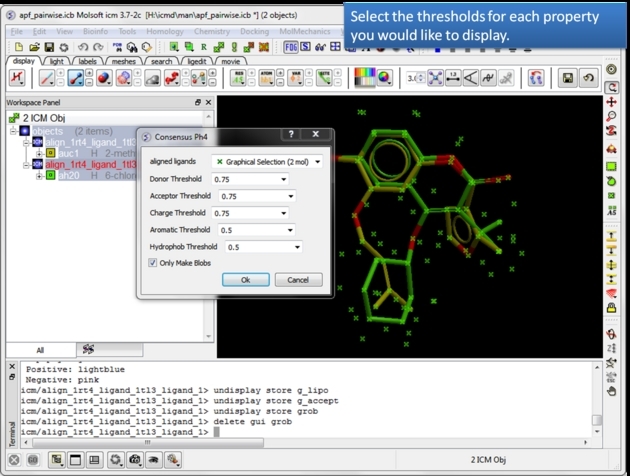 Perform ligand-based screening using APF fields. 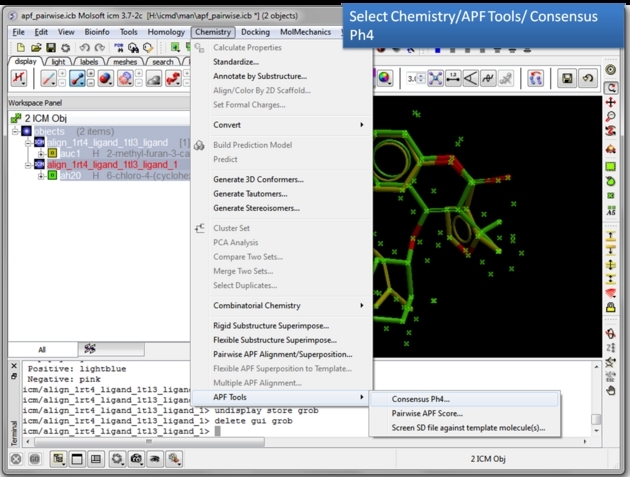 To generate a Consensus Pharmacophore based on APF fields use the Chemistry/APF Tools/Consensus Ph4 menu option. First convert your chemical into an ICM object. Load and display two or more superimposed chemicals. 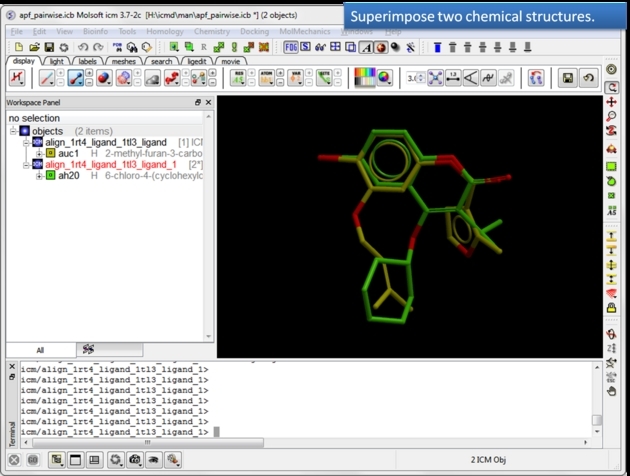 You can superimpose the chemcials using APF fields as described here or using substructure superposition. Select the ligands. 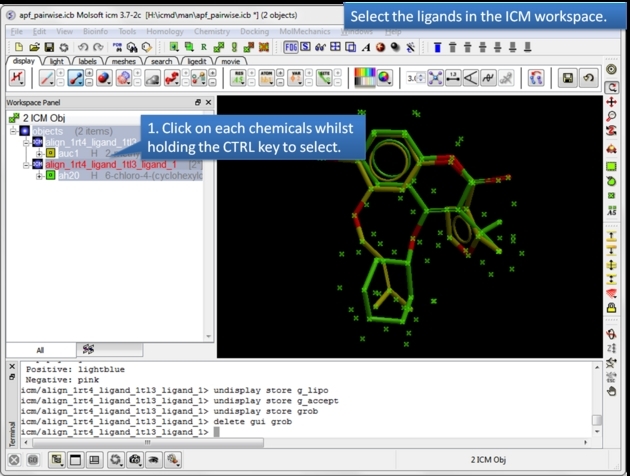 You can select the ligands by clicking on them in the ICM workspace whilst holding down the CTRL key. Aleternative selection modes are described here. Choose the Consensus Ph4 menu option. Chemistry/APF tools/Consensus Ph4. Select the threshold for each property. For example, if the setting is 0.75 then the pharmacophore will be displayed ifthe property is found in 75% or more of the ligands. Consensus is displayed as meshes. Each mesh can be displayed or undisplay in the ICM workspace. 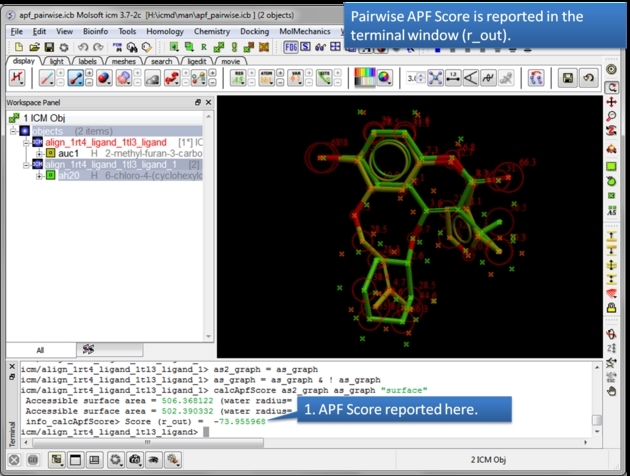 To determine how well the APF fields of two chemicals match you can determine the Pairwise APF Score using the Chemistry/APF Tools/Pairwise APF Score menu option. Load and display two superimposed chemicals. You can superimpose the chemcials using APF fields as described here. Select the first chemical. Use the green selection to orange button to select the first chemical. Select the second chemical. 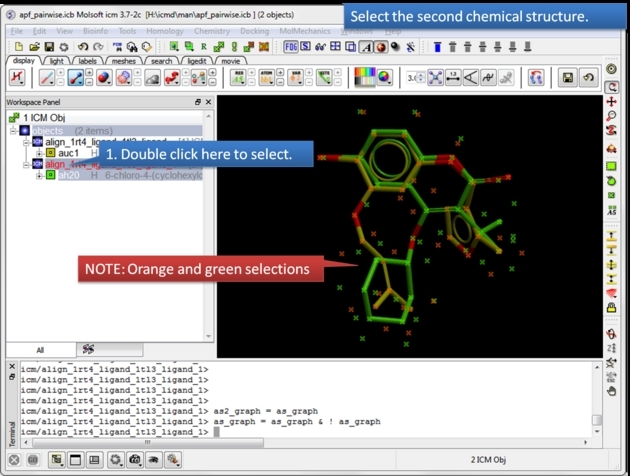 Double click the chemical in the ICM workspace to select it. Check the selections are correct. Choose whether you wish to calculate the score based on all atoms or just the surface atoms. The APF Pairwise Score is displayed in the terminal window. The score is also returned to r_out. Do not see the Terminal window? Go to Windows menu and check the Terminal box. This option allows you to perform a ligand-based screen using the Atomic Property Fields of superimposed chemicals. 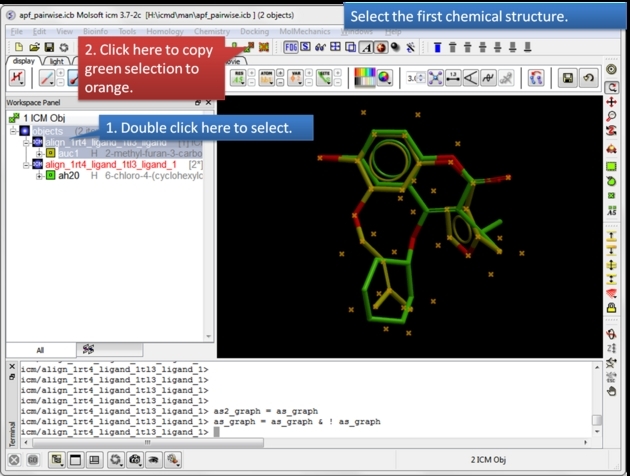 SD files are screened and the ligands are scored according to their fit into the APF field. The documentation for this option is in the Screening Chapter. This method uses 3D pharmacophores Atomic Property Fields . 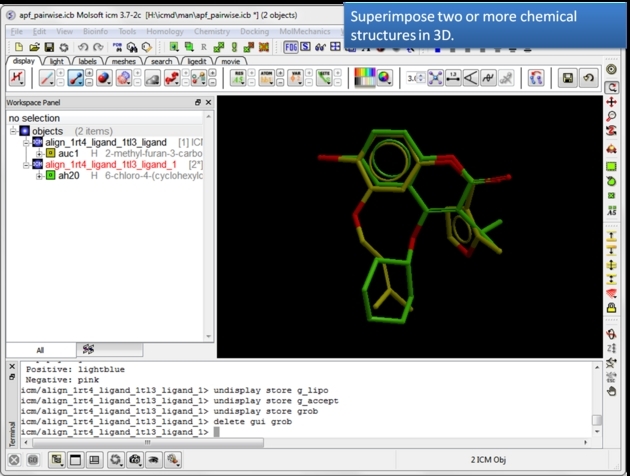 The APF 3D QSAR method relies on a set of superimposed chemicals. You can superimpose chemicals using the tools here. The 3D chemicals in the ICM workspace then need to be extracted to a chemical spreadsheet as described here. Both the chemicals used for training and the chemicals that you wish to predict need to be superimposed. Use the chemical table containing the superimposed chemicals (Step 1). This table should contain a mol column and a column containing activity data. 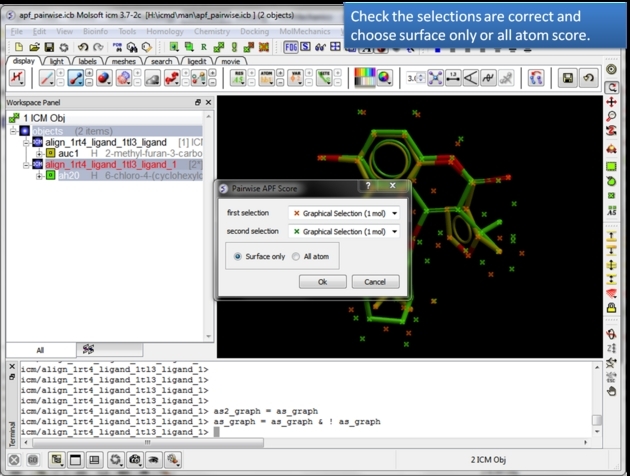 Chemistry/APF Tools/APF 3D QSAR and select the learn tab. Choose the name of the chemical table from the drop down list. Choose the column containing the activity data. The statistics related to the model can be seen in the model section of the ICM workspace - left hand side. A table called BASIS will be created containing a column with the predicted value and cross-predicted value for each element of the training set. Read in a chemical table containing data you wish to predict. The column formats must match the model table and the chemicals must be superimposed on the training set (See Step 1). 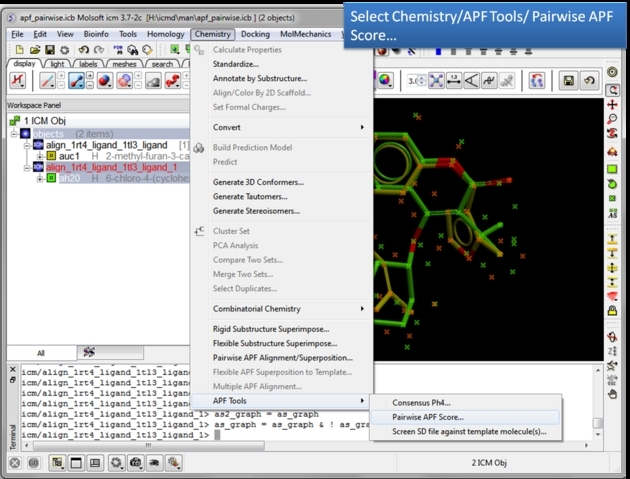 Chemistry/APF Tools/APF 3D QSAR/ and select the predict tab. Enter the name of the chemical table you wish to predict along witht the activity column name. The table will be appended with a prediction column called MolApfQsar. NOTE: The prediction model might be improved by removing some chemicals from the superposition in Step 1. It might be a subjective call as to which chemicals are good for the model and which ones should be removed. In some cases a crystal structure of a protein-ligand complex is available and the ligand pose would be a good template to superimpose onto.